Real Madrid capitalized on Barcelona's slip this weekend and after beating Elche by a 0-2 scoreline, they are now 4 points on top of their archrivals. Cristiano Ronaldo returned to his goalscoring habits in La Liga, while Benzema scored the opener and his 13th league goal of the season. After Barcelona's shock 1-0 loss to Malaga yesterday, the Merengues headed into their match against Elche knowing that a victory would put some much needed breathing room between the two sides. 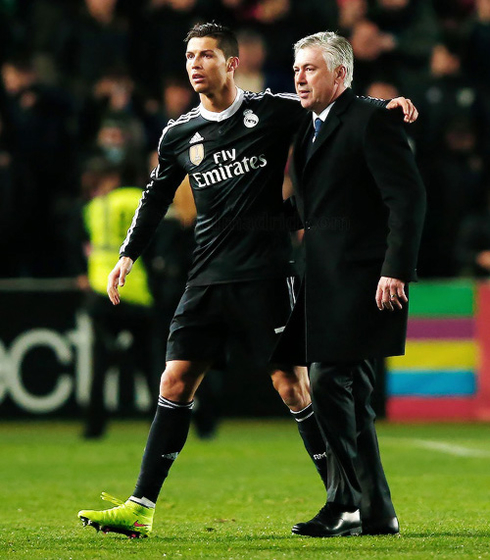 And Real Madrid wouldn't falter, capitalizing on the opportunity by securing a 2-0 victory away from home. Carlo Ancelotti named an unchanged side from the midweek match against Schalke, with Lucas Silva retaining his position in midfield alongside Toni Kroos. The continuity served Madrid well, they looked comfortable and despite a plucky display from the home side, the result never truly seemed in doubt. Not only that, but Cristiano Ronaldo also managed to find the back of the net in La Liga, allowing him to end his 3-game drought in Spain. Real Madrid would keep piling on the pressure, but Tyton and the rest of the Elche defense would hold firm as Madrid continued to misfire in front of goal. Gareth Bale, who's been heavily criticized for some inconsistent performances this season, was dangerous all game long. His juking runs produced a few fouls and cautions and Elche struggled to contain the longhaired Welshman all game long. In the 39th minute, the league leaders would be denied yet another goal, this time due to a refereeing decision. Gareth Bale's cross from the right was met by a fantastic Karim Benzema bicycle kick, that would have surely been the goal of the season had it counted, but the linesman raised the flag for offside. Replays showed however that the decision could have easily gone either way. The deadlock would finally be broken early in the second half, after an unfortunate mix-up in the back for Elche. Cristiano Ronaldo was the orchestrator, as he broke free down the left after a Marcelo through ball, just before squaring it into the center of the box. The ball was just out of reach of Tyton and heading straight for Benzema, when Elche defender Lomban's attempted clearance deflected off of Tyton to a waiting Benzema, for the easiest goal of his career. Madrid would double their lead 13 minutes later from a Ronaldo header, right after some excellent work from Isco down the left side. It's good to see Ronaldo slowing getting back into form after a disastrous start to 2015. It was classic Ronaldo, a bullet of a header from around the penalty spot into the roof of the net. It was also his 29th league goal of the season, which puts him 3 goals on top of Barcelona's Lionel Messi in La Liga's Pichichi standings. That would be the final score, as Real Madrid now sit four points clear at the summit of La Liga. Special plaudits go out to Lucas Silva and Isco. The latter, who has been on a brilliant tear of form for the majority of the season, was treated to a standing ovation by the Elche crowd when he departed. Silva on the other hand, looks set to play Asier Illarramendi right out of the club. He's far more dynamic than the Spaniard and he looked a natural fit next to Toni Kroos. Up next, the "Royal Whites" are back at the Santiago Bernabeu for a matchup with Villarreal next weekend (March 1). 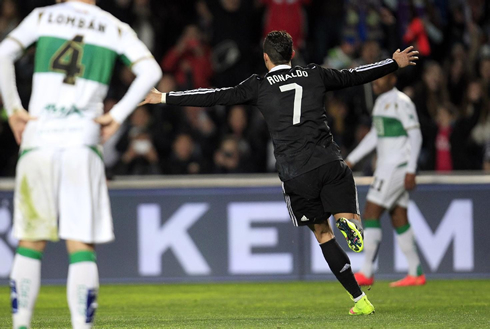 Cristiano Ronaldo next game will be for La Liga against Sevilla, on the 1st of March of 2015. You can watch Juventus live stream, Real Madrid vs Sevilla, Barcelona vs Manchester City, Bayer Leverkusen vs Atletico Madrid, Juventus vs Borussia Dortmund, and Sporting vs Wolfsburg, all matches provided from our football streams section.